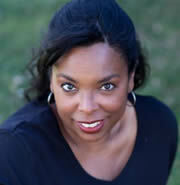 Everyone, please welcome Kimberly Reid to Rich in Color! 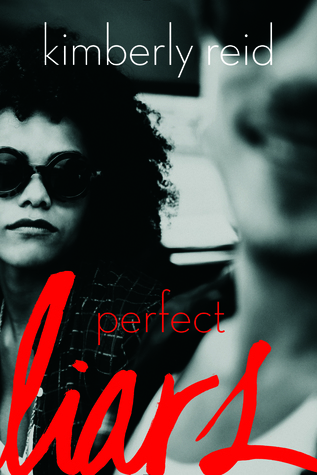 Kimberly’s new book, Perfect Liars, came out last week from Tu Books, and we’re very excited to chat with her about it. Perfect Liars sounds like a great summer read–is it on your to-read list yet? Andrea Faraday is junior class valedictorian at the exclusive Woodruff School, where she was voted Most Likely to Do Everything Right. But looks can be deceiving. When her parents disappear, her life—and her Perfect Girl charade—begins to crumble, and her scheme to put things right just takes the situation from bad to so much worse. Pretty soon she’s struck up the world’s least likely friendship with the juvenile delinquents at Justice Academy, the last exit on the road to jail—and the first stop on the way out. If she were telling it straight, friendship might not be the right word to describe their alliance, since Drea and her new associates could not be more different. She’s rich and privileged; they’re broke and, well, criminal. But Drea’s got a secret: she has more in common with the juvie kids than they’d ever suspect. When it turns out they share a common enemy, Drea suggests they join forces to set things right. Sometimes, to save the day, a good girl’s gotta be bad. 1. What were you most excited about when writing Perfect Liars? How is Perfect Liars different from your Langdon Prep series? What was your favorite part about each work? I enjoyed writing a cast of ex-juvie kids deemed “bad” by society working together to save their tiny part of it by applying the very skills that earned them that status. The Langdon Prep series and Perfect Liars both have strong female leads dealing with class, wealth and privilege, but from different sides. Chanti Evans in Langdon Prep has none of these things when she begins attending a school where everyone else does. It’s the reverse situation in Perfect Liars, where Andrea Faraday has is it all when she’s thrown together with kids who have nothing, not even their freedom in some cases. Drea and Chanti approach crime-solving and how they see the world from very different perspectives, though they ultimately want to help people who have less than they do. In the Langdon Prep books, my favorite thing is Chanti—I love her ferocity, how protective she is of her friends, family, and neighborhood despite their faults. I love that she has moments of self-doubt as we all do, but she plows ahead, anyway. She has far more confidence than I did as a sixteen-year-old. My favorite thing about Perfect Liars was writing Drea’s crew of characters. They’re criminals, but they have moments when they want to do what’s right, even while the temptation to do bad is difficult to resist. I like the way a common enemy brings them together despite their differences. When I see readers use #squadgoals when discussing Perfect Liars, it makes me smile. 2. I saw on your Tu Books bio that your mother is a homicide detective and your husband runs a city courtroom. How did those things influence Perfect Liars? So, so much. As a kid, I grew up around cops because my mother was a police officer. She later became an investigator for the district attorney’s office and eventually married my stepdad, a public defender, so the justice system—both the prosecution and defendant side of it—helped shape my perspective from a young age. The trend continued in my adulthood when I worked in the software business providing services to police departments. My husband worked for the police before moving to the courts. In fact, I was picking him up from work one day when I got the idea for Perfect Liars. I noticed all these teens hanging around his building. He told me there was an alternative high school housed in the justice center, that the juvie court judge was also the school’s co-principal, and that some of the kids had been through the detention system. I knew immediately this would be the setting of my next non-Langdon Prep book. 3. Andrea sounds like such an interesting protagonist! Can you tell us more about her? What did you enjoy most about writing her? My favorite thing about Drea is how her new friends—though she’s initially reluctant to call them that—make her question her belief system and prejudices. She may be a brown girl, but her wealth and class afford her some privilege that the juvie kids don’t have, even Jason, the white boy in the crew, to some extent. These kids unknowingly teach her lessons that challenge her to change, and to realize she has more in common with them than she’s willing to admit. 4. I’m interested in learning more about the kids Andrea teams up with at the Justice Academy. Can you give us a sentence or two about each of them? Gigi is wise beyond her years, brilliant with languages (she’s fluent in eleven of them), and could convince you the sky isn’t blue even while you’re staring at it. She knows her mind and will suffer no fools—she ain’t got time for that. Jason can hack anything tech but is clueless when it comes to people, or so it seems. His appearance can deceive—he’s the youngest of the crew and baby-faced, but is perpetually angry at the world because it has been hard on him and he resents that. Xavier is calm and always in control, even though he’s had more heartache in his seventeen years than anyone should. He’s very good at reading people and situations, but you can’t be fooled by his zen-like approach to life because he can also jack someone up if the situation calls for it. 5. What are some of your favorite books? Have any of them inspired or influenced your writing? The minute I could string a sentence together, I began writing poems, and I still love poetry, but the first book I can remember reading that made me want to be a novelist is A Tree Grows in Brooklyn. I was about ten or eleven, and didn’t really understand all the themes, but despite it being set in the early twentieth century in a world that had nothing to do with me, and included the bigotry of the time, I connected to Francie Nolan. It impressed me that the author could do that, make up people that felt real enough that I was convinced I knew them, and I wanted to do that, too. In high school, I was influenced by John Steinbeck and Jane Austen—they may be part of the reason I tend to write about class so often. In college, I discovered the work of Toni Morrison, Alice Walker, and Ernest Gaines. Favorite writers now include a range from Edwidge Danticat to Lee Childs to Chang Rae-Lee to Walter Mosley. I don’t think I write like any of them (I wish! ), but they all inspire my writing because I want to write characters my readers connect with, and stories my readers thrill to, the way their characters and stories do for me. 6. What books by or about people of color or people from First/Native Nations are you looking forward to this year? Or already came out this year? I have a lot of YA on the list. Outrun the Moon by Stacey Lee. Shiny Broken Pieces by Dhonielle Clayton and Sona Charaipotra. Even if the Stars Fall by Mia Garcia. Keep Me in Mind by Jaime Reed. Shame the Stars by Guadalupe Garcia McCall. I’m looking forward to the third book in Joseph Bruchac’s Killer of Enemies series, Valynne Maetani’s next book, and The Hate U Give by Angela Thomas. Some of these may not be out until next year—I’m not sure—but I look forward to them all. Kimberly Reid is the author of the Langdon Prep young adult mystery series starting with My Own Worst Frenemy, and the Colorado Book Award winning memoir No Place Safe. Most of Reid’s family is in the crime-fighting business—her mother was a homicide detective, and her husband runs a city courtroom—so she can’t help but write crime fiction, knowing she’ll never run out of stories. She currently lives near Denver, Colorado, but her roots are firmly planted in Georgia clay and she still calls Atlanta home.